Today, Android's backers like to point out that (at least in terms of unit market share) Android is "winning" both in smartphone and in tablet shipment figures. They use this data point to predict that a similar shift will occur in the fields of automotive integration, wearables and in the living room with TV and video game systems. However, Android as a platform is not winning in any way that matters commercially. And in fact, the "success" that Android now enjoys is virtually identical to the kind of ubiquitous shipment share that Symbian claimed in the early days of the smartphone industry, just a few years before it collapsed at the feet of Apple's iPhone in 2009. Symbian, developed in a 1998 partnership that initially included Psion (the PDA maker that created its origins), Nokia, Ericsson and Motorola, eventually became a widely licensed mobile platform led by Nokia. It was also adapted by Sony Ericsson, Japan's NTT DoCoMo, Samsung and many others. While tech history is quickly forgotten, it's useful to remember that in 2009 Samsung's smartphone lineup was 80 percent Windows Mobile and 20 percent Symbian, and it had just migrated its flagship Omni model from Windows Mobile to Symbian ("Omnia HD") in an effort to not look ridiculous next to Apple's iPhone 3GS. Sony Ericsson had made a similar transition, replacing its 2008 Windows Mobile Xperia X1 flagship failure with a new Symbian-based "Idou" concept for 2009. It too failed. Today, Samsung is saying that it will similarly transition from Android to its own Tizen operating system. Coming from Android's largest licensee (by far), that's hardly an endorsement of Android. But first, consider what happened when Samsung and other foreign hardware makers grew tired of Symbian and its inability to keep up with Apple's iOS. Nokia ended up taking over its Symbian platform in late 2008 just as Symbian began proving itself incapable of competing against the iPhone 3G. In the spirit of Mozilla, Nokia converted Symbian into an open source project for the community to develop, an effort that failed entirely. Android has seemingly proved far more successful than Symbian. However, while Symbian essentially ruled the early smartphone market for nearly a decade, Android has only been around about half that long. Android also hasn't captured the same share as Symbian once had world wide, neither in its cut of volume units nor in terms of valuable, premium market share. Symbian isn't the only harbinger of Android's future. While Symbian is often viewed as the first and largest original smartphone platform, Sun's Java Mobile overlapped it as a mobile software middleware platform, enabling the development applets that could ostensibly run not only on Symbian phones but also Palm, BlackBerry, Windows Mobile and even simple embedded phones that hosted the Java Mobile environment on top of Linux. In fact, the only smartphone that famously couldn't run Java Mobile applets was Apple's new iPhone released in 2007. Java Mobile was perceived as such an important platform at the time that when Steve Jobs was asked about the newly announced iPhone's ability to run Sun's Java and Adobe's Flash, he confidently said the new iPhone wouldn't run Flash but only committed to "maybe" when addressing Java. The success of native iOS App Store titles eventually erased any allure of Java Mobile, but Apple had a tense year of deflecting attention away from the question of whether the iPhone would ever run the supposed vast array of Java Mobile applets available. Sun kept the tech media fully immersed in the marketing line that Java Mobile was "the Most Ubiquitous Application Platform for Mobile Devices," and the majority of those journalists reporting on the subject proved themselves fully unable to imagine the potential of that situation ever changing. But it did, and very rapidly. While Sun attempted to float its own copycat "JPhone" at its summer 2007 JavaOne conference, and then promised to release Java Mobile for iPhone in 2008, the success of Apple's iOS App Store suddenly diverted a critical mass of attention away from the "ubiquitous" Java Mobile and toward Apple's "commercial viable" iOS. After Apple's iPhone became firmly established with a healthy installed user base capable of running "desktop-class" iOS apps based on a mobile-optimized version of the Mac's OS X Cocoa development frameworks, Google reintroduced a derivative version of Java Mobile running on Linux, branded as Android. Initially, the new phone platform was aimed at hobbyists. But by 2009, it began to gain attention from major manufacturers who had, up to that point, been struggling to get Sun's official Java Mobile to work. Like Sun's official Java Mobile on Linux, Google's free Android software has facilitated the rapid development of hardware products. But it isn't doing this very successfully, because the majority of Android licensees are losing money on Android hardware (including Google itself) because the products Android helps to "innovate" are not compelling enough to attract premium buyers. This is an important fact to keep in mind for later. But first, consider what Android has actually accomplished over its first five years. Between 2004 and 2007 when the iPhone first appeared, Symbian powered around 60 percent of smartphones in China and well above 80 percent of smartphones everywhere else apart from North America, where popular sales of Palm and BlackBerry smartphones had kept Symbian in the minority. 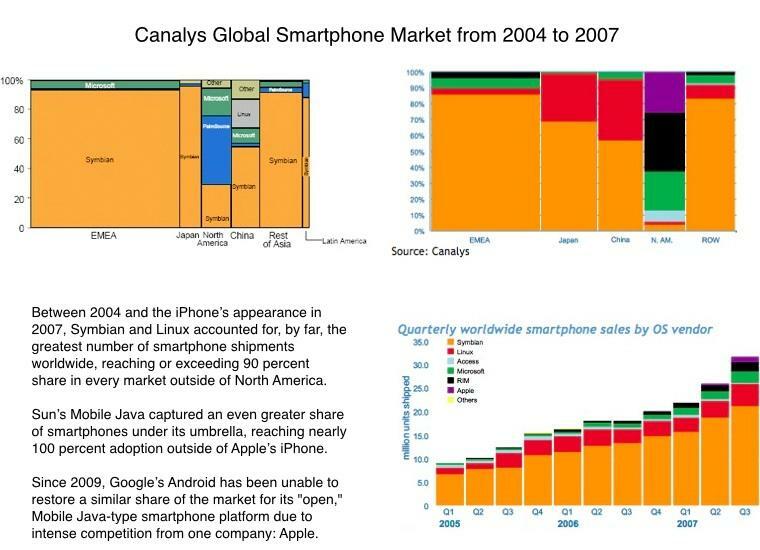 Combine Symbian with generic Linux (particularly in China where Motorola was selling lots of closed Linux phones), and "open" platforms accounted for 90 percent or more of the world's smartphones quite consistently between 2004 and 2007, everywhere else but in North America. Android therefore isn't a new thing; it is the continuation of what was once the status quo when the iPhone arrived. It's the world's foreign smartphone makers attempting to make do with a cost effective, communal software platform. However, the difference between 2007 and 2014 is that Apple isn't just taking a significant portion (27 percent) of North American sales anymore. Today, Apple commands by far the largest share of high end smartphone sales globally, having sold 150 million iPhones in 2013 compared to Samsung's 100 million shipments of premium Galaxy S and Note phones. 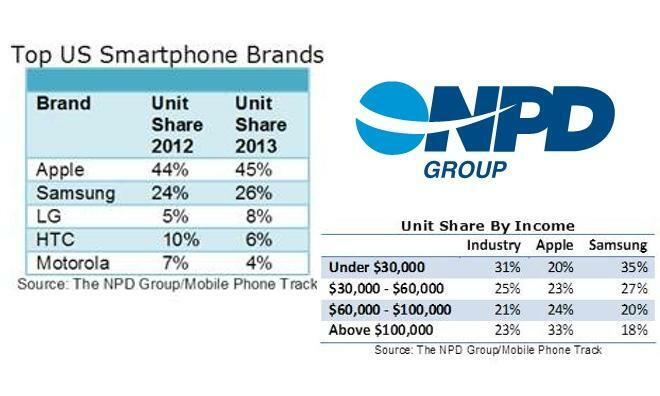 No other smartphone maker even reports sales numbers of their premium, iPhone-class device sales, and for good reason. They're not selling enough to brag about them. LG's flagship G2 fell far under expectations with quarterly sales of around 2.3M, while Google's flagship Moto X sold just 0.1M phones in its launch quarter, despite being priced far below Apple's top of the line iPhone 5s. HTC's flagship One lineup and Nokia's high end Lumia phones are similarly not attracting sustainable audiences. Apple is trouncing every phone maker on earth in the valuable and lucrative premium segment of the smartphone market. This is not even controversial. However, even when you fold in shipments of "basic smartphones" like Samsung's Galaxy Y and generic "white box" shipments (mass market, sub-$200 devices that Apple doesn't even currently sell), the iPhone's global market share as reported by IDC remains above 17 percent worldwide. And in the U.S., Apple's iPhone share is now at around 45 percent and still growing, according to NPD. Apple's global iPhone sales have achieved a far greater share percentage of the world's smartphone sales than the combined reach that BlackBerry, Microsoft and Palm achieved between 2004-2007, back when nobody was saying that those three platforms were going to lose share to Symbian and or Linux in the way that IDC, Gartner and Strategy Analytics consistently fret about iOS "losing share" to Android in their press releases today. Conversely, the dominant mobile platform between 2004 and 2007 (which one could arguably identify as either Symbian or Sun's Java Mobile, which ran on Symbian, Linux, BlackBerry, Windows Mobile, Palm and Linux) has contracted from between 90 to almost 100 percent of all smartphone shipments when the iPhone appeared to a figure now at around 78 percent for Android. Remember, that's unit share. Android doesn't have 78 percent of the valuable share in the market; it only has a virtual lock on low end devices that make nearly no money. There are two reasons for this. First, while Google and its Android partners would love to have a larger cut of the lucrative, premium phone market, they have simply been unable to deliver products that the market desires, with the notable exception of Samsung. And Samsung's success hasn't been due to using Android; it's quite clearly due to using Apple's designs. There's a black and white difference between Android vendors who follow Google's design cues on one side (Motorola lost over $2.3 billion over the past two years doing this) and between Samsung, which has been successful in smartphones since it engaged in a concerted effort to copy Apple's iPhone 3GS, its marketing, its packaging and its accessories in early 2010. Google's packaging of a revamped Java Mobile on top of Linux has rebranded the generic platform that existed before it, but it hasn't been able to maintain the same industry dominating market share. And that's true even before Apple has gained full access to vast markets including China and India. In affluent markets where Apple has its products on every major carrier, including the U.S. and Japan, Android's share has taken a severe beating. That's allowing Apple to siphon off a 53 percent share of the industry's profits worldwide, with the remaining profits being taken almost entirely by Samsung. The reality is that Android isn't taking share from Apple; it's falling to maintain the dominant share position Sun's Java Mobile once held, and it's having to do this via desperate volume plays involving loss leaders or the razor thin margins of low end product categories that Apple isn't even bothering to address. Outside of smartphones, things look even bleaker for Android, as the following segment will address. Android hasn't just failed to restore the dominant monoculture that Symbian and Java Mobile once imposed over smartphones in the model of Microsoft Windows on the desktop. It has also proven unable to advance the combined efforts of worldwide manufacturers to successfully compete against Apple. Android was once associated with previewing technology features ahead of Apple. For example, Motorola and most other hardware makers shipped 4G LTE handsets well in advance of the first 4G iPhone 5. Android licensees once bested Apple's iPhone cameras, and for the first half of 2010, they delivered high resolution displays that were superior to the iPhone. But those advances weren't because of Android; they were due to the fact that Motorola, Samsung, LG, HTC and other Android licensees had been established mobile manufacturers for many years before Apple launched the iPhone. It's hardly surprising that they would have a long lead in delivering their own technologies first, at least for a few years. After nearly five years of inhaling the majority of the phone industry's profits (that's right, not just smartphones but all mobile devices), Apple is now in a position that is very difficult to compete against. In 2011 Apple launched Siri, a beta feature that iOS 5 delivered across Apple's entire user base even as Google struggled to get more than a fraction of Android users on a new enough edition of Android to support its own voice search features. In 2012 Apple launched its own Maps to replace Google's, and within a year it had eaten up 80 percent of the valuable traffic Google had been benefitting from as the formerly default purveyor of maps to iOS users. Last year Apple launched iPhone 5s with a modern 64-bit Application Processor and deeply integrated, secure support for Touch ID fingerprint unlocking and purchase authentication. Google had struggled for years trying to implement its own Google Wallet micro-purchasing system for Android using inferior NFC technology paired to various Android devices that suffered a variety of security and incompatibility issues. Third parties can recompile Android to run on 64-bit Intel chips, but they can't reengineer the existing installed base of Android into a secure platform. Security isn't a core value for Android. Google's ideological bent toward "openness" precludes real security, forcing vendors like Samsung to tack on cumbersome security diapers like Knox to clean up the embarrassing leaks Google has permitted its hippie star child to roll in because it didn't want to impose too many boundaries. 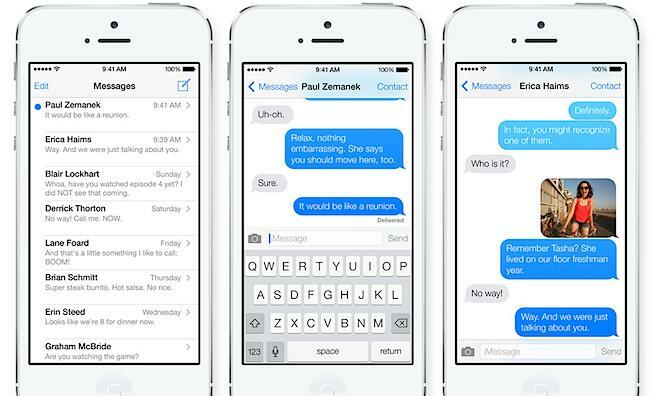 It's particularly notable that in 2013, the year that certain members of the media began fighting over who could shout "Apple isn't innovating" louder and more incessantly, was the same year that Google completely failed to launch an ambitious new Android 5.0 to counter Apple's own significantly new iOS 7 release. The tech media has been curiously silent about that lack of "innovation." Instead, Google just quietly bumped its Android platform down a notch to better work on the low end types of hardware that Android is actually shipping on. 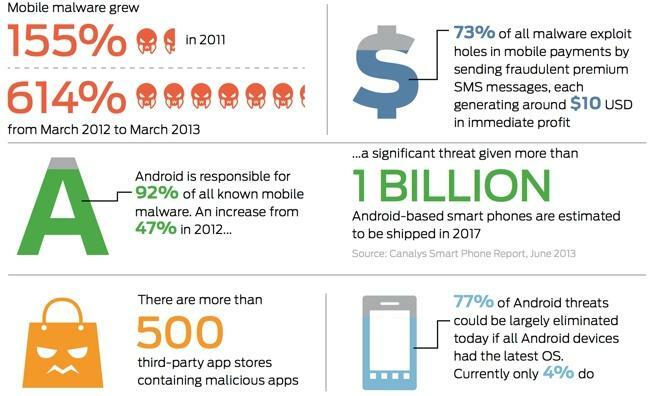 And while Apple has converted virtually all of its customers globally to iOS 7 within just a few months, Google's installed base is still overwhelmingly stuck on outdated versions of Android with known security flaws. In 2008, it became broadly apparent to the tech industry that Symbian was an outdated platform based on yesterday's technology and lacking the resources to innovate its way into the future, a gargantuan task that was impossible for even the then still profitable Nokia and the world community of open source developers available to contribute their efforts. Five years later, it should be apparent that the troubles Symbian suffered are reappearing for Google and its Android platform based on its outdated notion of applets running on a Java-like virtual machine. Google can't roll out even its latest minor updates to more than a couple percentage points of its most active Google Play users in the space of several months. How could it possibly transition its Android installed base to a new, secure and modern mobile platform? Recall that it took Microsoft half a decade to migrate its Windows 95/DOS users to a more substantial Windows NT OS foundation, and that was between 1995-2002, when Microsoft faced virtually no competition in PC operating systems. Since then, Apple has gone from a minor PC vendor to the world's largest computer maker, providing Microsoft with increasingly fierce competition. How well has Microsoft fared? In 2006, it began struggling to update its Windows users to Vista, a release that borrowed heavily from ideas in OS X, including the modern graphics composition engine Apple had debuted five years earlier. Microsoft is now struggling to gain traction with Windows 8, which attempts to force the Windows user base to a new environment that works like an inconsistent amalgam of Apple's iPad and the 1990s' Windows desktop. Meanwhile, Apple is releasing progressive new versions of iOS and OS X in tandem every year, and its users are rapidly and enthusiastically adopting each one at a pace that has never occured before in the history of technology. Google shouldn't entertain any comparisons between the future of Android and the history of Windows. Or for that matter Symbian, or Java Mobile, or Linux, all of which have struggled in the consumer market despite carrying the same "open" battle flag that Android does now. Additionally, while Microsoft successfully taxed the PC industry with Windows licensing fees for the decade during which it effectively had no competition, Google is not collecting such fees nor it is operating without significant competition. Additionally, it's useful to remember that looking back, it wasn't Symbian or Java Mobile that benefitted during the pre-iPhone days of the smartphone industry. It was the hardware makers who were profiting, principally Nokia, Palm, RIM/BlackBerry and HTC, (which at one point was making 80 percent of Microsoft's Windows Phone devices). It therefore shouldn't be too hard to understand why Apple is making the most money, by far, in today's mobile market, nor why Apple is lined up to continue making the lion's share of profits in the future. And looking at the history of iPods, it should be obvious that once Apple runs out of easy low hanging fruit among high end smartphones, it will have the upper hand in developing desirable low end devices to attack the remaining volume of the mobile market, just as it did with the iPod mini, iPod nano and iPod shuffle. Smartphones aren't the only battleground in the mobile market. A look at how the Android platform has fared elsewhere only reinforces the reality that Apple's future in mobile devices, automotive integration, wearables and in the home is going to be impossibly difficult to compete against with an "open" platform that waters down vendors' ability differentiate their products while holding back the pace of innovation to accommodate low end, mass market volume sales in the interest of spreading Google's ad empire. The next segment will expand upon this.